Ryan Mitstifer Walton isn’t your typical 15-year-old. 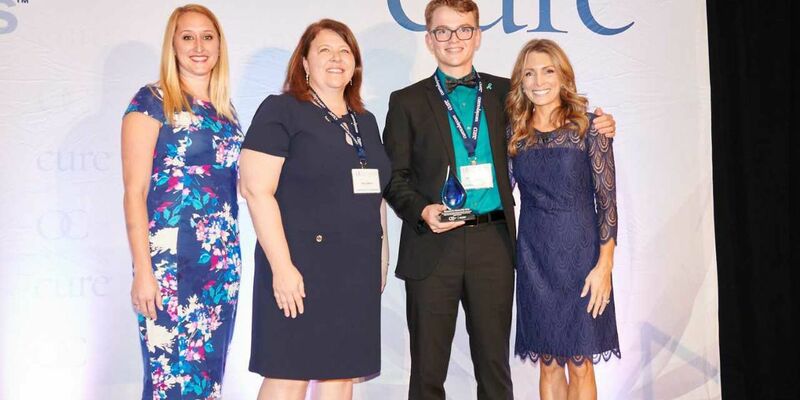 TUCSON, AZ (KOLD News 13) - CURE Media Group honored Ryan Mitstifer Walton, a Sabino High School sophomore in Tucson, as one of three ovarian cancer heroes for 2019 at the Hawaii Convention Center in Honolulu, Hawaii, during the Society of Gynecologic Oncology Annual Meeting on Women’s Cancer, March 15. The recognized heroes are individuals who have made a difference within the ovarian cancer community . His age hasn’t limited him from writing and delivering speeches at national conferences or participating in charity programs..
Walton is motivated by his own mother’s battle against ovarian cancer, as she suffered from the disease during her pregnancy with him. He now uses his personal perspective to inspire. He opened the National Ovarian Cancer Coalition Hope on the Horizon National Conference in New York City with his “Forever Bonded by Teal” presentation. Following his speaking debut in New York City, he presented again at Tesaro headquarters in Massachusetts to open ovarian cancer awareness month in September 2018. Ryan actively participates in various ovarian cancer charity programs such as Teal2Gethers, Ride for Hope and run or walks to break the silence on the disease. CURE Media Group’s flagship product, CURE® magazine – which reaches over a million patients, survivors and caregivers and is dedicated to providing cancer updates – also honored two other individuals who have made a difference.